These practices as well as our versatile product and services offerings are just some of the ways in which Bridgeview Bank employees take pride. 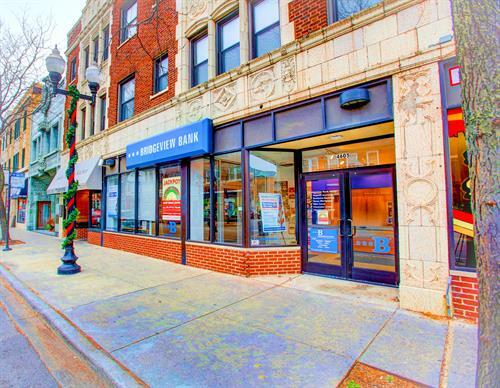 Today, Bridgeview Bank operates more than 15 full-service banking facilities, including two locations in Bridgeview, the Western and North Shore suburbs - and in the Andersonville, Edgewater, Lincoln Park, Lincoln Square, and Uptown communities in Chicago. Still family owned and operated, Bridgeview Bank is actively involved in the communities it serves. Through our 40 successful years in your community and throughout Chicagoland, we pledge to continue the tradition of helping individuals and business owners in our backyard meet and exceed their financial goals. Located at 4605 N. Lincoln Lincoln Avenue (East side). Slightly North of Wilson (near Starbucks).